This single parenting thing is so difficult. I get confused by all the different situations, personalities, struggles, and issues of my children. I can’t seem to get my feet under me on any of them! I think I might actually be more confused by my issues, struggles, emotions, and stresses than I am by any of my children’s. Sometimes people are offended when I say that. They want to correct me and say I shouldn’t say that. That I shouldn’t be that. That I should get my act together. That I should be past the emotions…that’ll be a God-sized task! That I should get out of the pit, but I’m not in a pit…life is just challenging right now. That I should just put my big girl pants on already…Yeah…well, my big girl pants are on, believe me. They don’t fit comfortably…they are sometimes too tight, sometimes too loose, sometimes too itchy, sometimes too stiff, sometimes too soft, sometimes the tag rubs wrong, sometimes they are on backwards and sometimes they are inside-out. But they are on. Dang it. I think I’d like to say this…ITS OKAY TO BE A LITTLE BIT OF A MESS!!! I looked up trials, tribulation and trouble in the back of my Bible and they pretty much seem like a given. BUT God does not leave us in these troubles. Perfect, complete, lacking nothing…sounds pretty good. Perfect is a pretty daunting word, but in this verse it does not mean being sinless. It refers to our spiritual maturity. That’s totally who I want to be…stable, godly, righteous, not wobbly, messy, and self-centered. And then I read about Paul…Paul who suffered mightily on this earth and begged God to take away his thorn, shared openly about his struggles…Paul, who had a passion for the Lord that I long for, shared how He wrestled with things…like sin and circumstances that were by no means ideal. BUT THE NEXT VERSE IS AWESOME!!! After Paul shares of his struggles with sin, he reminds us and himself, that because of Jesus we are not condemned! How beautiful! When I share my struggles, like Paul I want to point me (and you) back to Jesus. Because let’s face it, we all struggle with something. How much better if we could share our struggles and our victories in order to encourage and bless one another without receiving any condemnation! It would be such a monumental thing if we as the Body of Christ could be open and share without condemnation. If we could choose to walk alongside one another through our struggles and the battles we fight in order to share the victories! And there will be victories because the battle is the Lord’s! Although I’m okay with sharing it, I’d really like to not be a mess. I’d really like to get my act together. But God is showing me that getting my act together isn’t really what I think it is. I tend to think if I could just get a full-night sleep that would help, maybe some exercise, a well-ordered house, some children that actually do what I ask/tell them to do…you know, basically the perfect life…then I wouldn’t be a mess. But life is messy. And people are messy. And relationships are messy. And circumstances are messy. And God tells us we will have trouble in this world…but He also says that we aren’t to fear it. He has never been nor will he ever be surprised or overwhelmed by trouble, trials or messiness. He isn’t done with me because I’m a mess. He loves me always, completely, relentlessly. 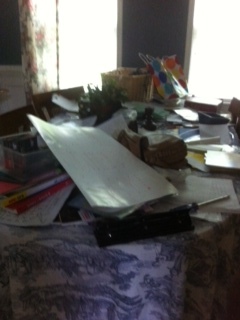 When God looks at me He doesn’t see my mess (thankfully! ), He sees Jesus’ perfection. I always thought that was one of the best verses to memorize. That word lavished is such a wonderful description of how God pours His love on us. It isn’t a small amount, just enough to get us through the day. It isn’t a decent amount that comforts us when things go badly. He gives us limitless love. There is no end to His love for us. The chapter goes on to say that we know this is love because “Jesus Christ laid down his life for us” (verse 16). My friend, God doesn’t just say He loves you; He demonstrated that love when, on the cross, He rescued you from your sin: “God shows his love for us in that while we were still sinners, Christ died for us” (Romans 5:8 ESV). How valuable you are in His sight! God knows you and loves you. “Why, even the hairs of your head are all numbered. [So] fear not; you are of more value than many sparrows” (Luke 12:7 ESV). To all of us who believe in His name, “he gave the right to become children of God” (John 1:12). You are chosen, rescued, and forgiven because of Jesus’ sacrifice on the cross (Galatians 3:13; 1 Peter 2:9-10). I long for all of us to understand what Jesus has done for us. We didn’t do anything worthy of His good opinion. And yet Christ still died for us. He knew our tendencies, our temptations, and our sins, and He still loved us enough to die for us. He still loves us enough to die for us. And He didn’t choose us just because we were all cute and adorable. He chose us when we were all dirty, smelly, and rebellious. He loves us even when we feel unlovable. Allow Him to “quiet you with his love” (Zephaniah 3:17), to calm your anxious thought, and to assure you that regardless of how you’re feeling or what you’re going through at this moment, you are dearly loved. We might feel like messes, but when God looks at us He sees His precious child. We might be uncomfortable with our mess, our children’s messes and the messes of others, but God isn’t. He is willing and able to walk us through the mess. He will stick with us. All that He asks is that we trust Him. Trust Him with our hurting, exhausted selves. Trust Him with our children. Trust Him with our circumstances. Trust Him with our messiness. “Practically speaking, God obviously wasn’t doing my dishes for me or dealing with my sticky counters, but His presence gave me strength to face each task, whether tedious or terrifying. Dearest, trust God to take care of you. You will be amazed at what wonderful stuff He can bring out of our messes! Thank you for this post and for the reminder that God sees our hearts, not our messes!! I love this post! Thank you so much for your honesty. Sometimes I feel like I need to hide that I am struggling. I all too often answer “How are you” with “just fine” without even thinking about it. Maybe we’re not messes. Maybe we are the masterpieces that God made us and we just feel like we are messes because of the lies that we’ve believed. Lies like we should live a certain way, look a certain way, dress and act a certain way buy certain things, eat this, do that. What society expects from us is all too much. I think what God wants from us and what our culture/society want from us is too much. If God doesn’t see you as a mess then why should you? Who is saying that you are a mess? Are they right? Are you really a ‘mess’? I’ve learned to simplify. Aim to improve something small each and every day. Dream big dreams, work hard, rest and accept our limitations. I’ve learned to never call myself a ‘single mum’. Because those words carry so many pre-conceived ideas. I was thinking like ‘poor me I’m a single mum people should feel sorry for me and they will, I will be poor, I will be fat and sad and lonely, my kids may end up screwed up etc..’ I realised that I had to get rid of thinking of myself as a single mum and what that may mean. I’m Emma and I’m an amazing, incredible, much loved daughter of the Most High God. I’m in charge of my life, it’s time to stop dwelling on all the wrongs people have dealt me and start living my new life and reaching for greatness. It’s hard. Every darn day. Most people cannot imagine the pain I’ve been through or how hard life is. But I’m never going to stop, never going to give up and I’m not backing down. I choose to look forward to what could be and will never accept that this current situation is the way it always has to be. I’m not going to voice the thoughts that I’m a mess because that gives those words power and that is what I will become. Sure things seem messy right now but here is what I am: I am capable, I am loved, I am powerful, I am creative, I am resourceful and I am stronger than I will ever know – I have the same strength that resurrected Jesus from the grave inside of me and so do you. Thank you, as always, for the reminder that the “stuff” of life isn’t what life is about. Being a single mom takes so much out of you that it’s really hard to see past the messes, problems, struggles, etc…. I have to literally remind myself every day to take time to enjoy God. And your blog helps with that!!! So glad I found your blog! When I find a good blog its like finding a good book 🙂 I was a single mom for 9 years I didn’t get saved until I was pregnant/married/divorced. Then God spent 9 years alone with me. I do blog but not nearly enough. I am finishing a book about the whole ordeal now 🙂 I only had one to raise by myself and he is 14. The teen years are the hardest. I have been married for 3 years now. God is faithful to answer our prayers. But if I had to be a single mom (or person) again….I could do it!! I am so much stronger after I spent “alone time” with God. God is enough…I can say that and mean it now. I struggled with that for a long time though.